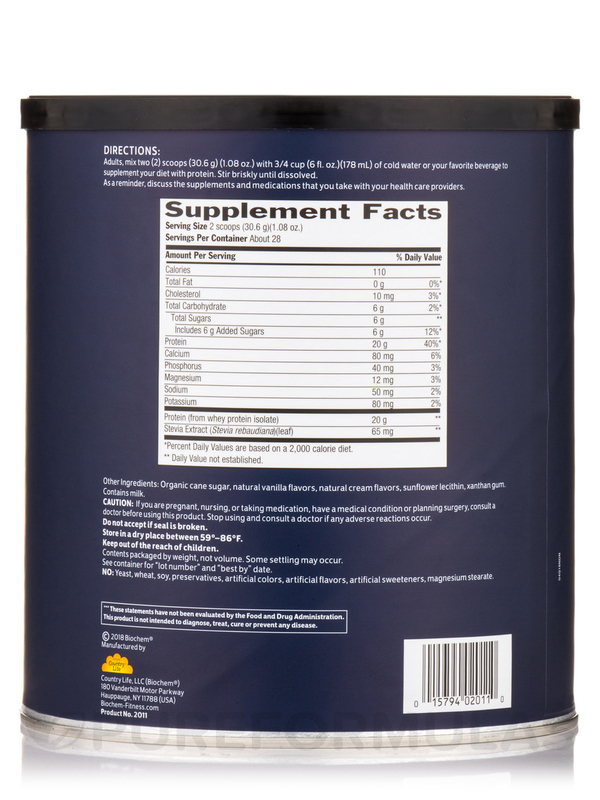 100% Whey Protein Powder is a great natural protein powder. Tastes like natural vanilla. Great lost low price and good quality. Fast and free shipping. Whey Protein Powder is an easy way to obtain extra protein for workouts. I mix Whey Protein Powder with applesauce and essentially come up with my own modified pudding delight. 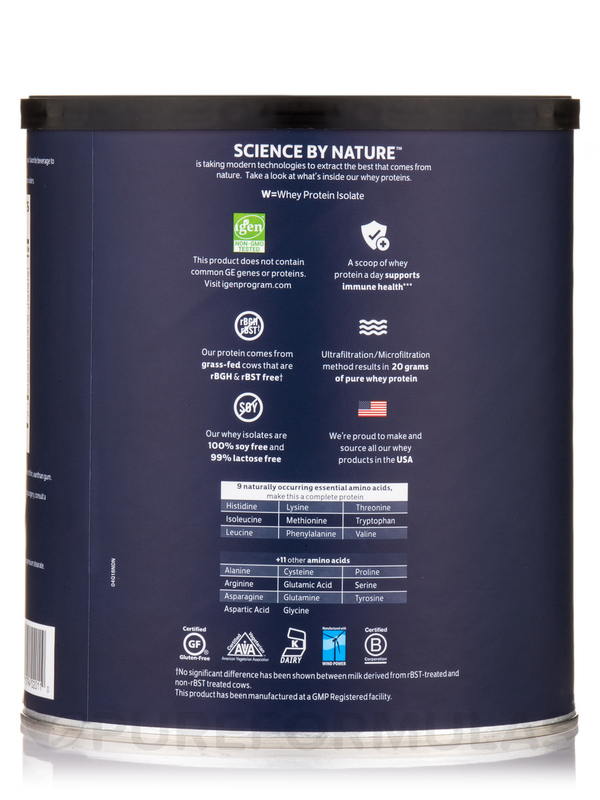 100% Whey Protein Powder by Biochem Sports was thin and kind of flavorless. It could be used as a base for a smoothy. But, I wanted something I could mix and drink as is. 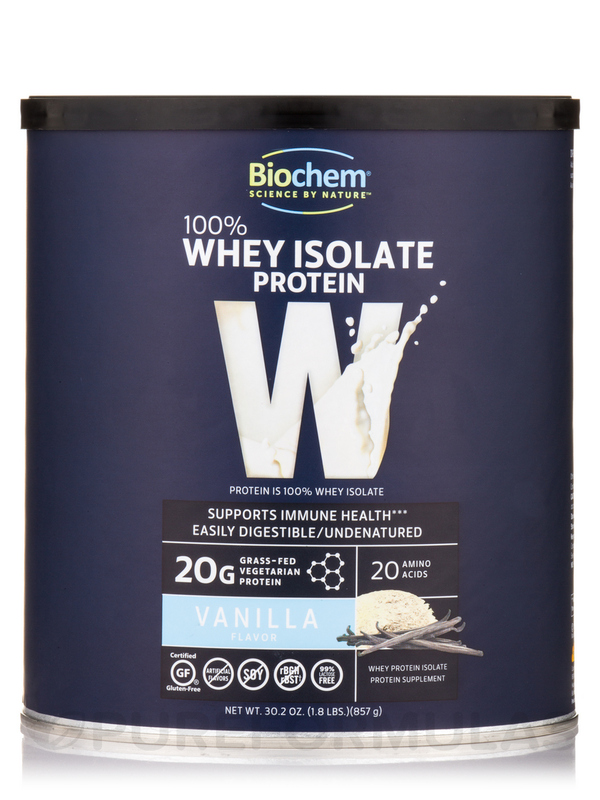 I love 100% Whey Protein Powder Vanilla Flavor by Biochem Sports, it's so delicious. I love the fact that it's a big container. It's very tasty, doesn't leave a bad aftertaste. I love the fact that it doesn't have any of that artificial flavors and all of that bad stuff. The only protein powder I use! My husband and I have tried many protein powders over the years but most were hard on the tummy and digestion. We both love 100% Whey Protein Powder by Biochem Sports because we love it with our morning smoothies and it's easy to digest. The taste is great with milk or almond milk. Easy to use, tastes great, easy on the digestive track, and affordable. It doesn't taste good mixed with water. Got this Whey Protein Powder by Biochem Sports to supplement a vegetarian diet - to aid in slightly low amino acid levels on my kids. I have stomach sensitivities and 100%Whey Protein Powder by Biochem Sports is the best and only powder I can use. It tastes great alone, in shakes, or even Greek yogurt. I eat it almost every day! Doesn't dissolve as well as other powders because they use real sugar. OK, first let me say, I prefer Whey Protein Powder by Biochem Sports in vanilla flavor over the chocolate, because you can do so much more with this. I can add almost anything to it. I do mostly use my personal size smoothie maker and if you're using those, instead of a large blender I do recommend mixing all your powders with some liquid in a bowl first and then pouring it in your blender. I know it's one more dish to dirty, but when I'm adding Hemp Powder & Peanut Butter Powder etc., I can get a gritty taste if I don't combine it first. That doesn't happen in the Cuisinart, but I don't usually want to dirty up the big monster for one little smoothie. As far as taste goes, this is one of the better ones and it's a good price for the amount of servings you get. The amount of servings for the price. The taste is not overly sweet. Would have liked more vanilla taste to it. I love Whey Protien Powder by Biochem Sports. It tastes so creamy and natural. It mixes well with almond or coconut milk. I enjoy it best with pineapple, coconut milk and a couple cubes of ice. Sometimes I will add flax meal for extra nutrition. taste, texture, simple ingredients, nutritional profile, low sugar. Not the same great Biochem whey protein! Just received this new Biochem product that Country Life is now manufacturing an its not the same formula. 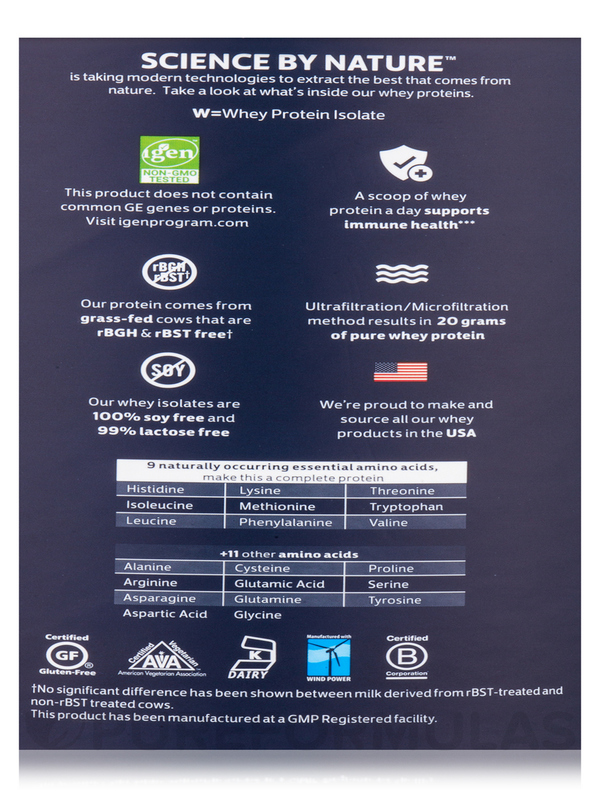 It leaves an unpleasant aftertaste and I m so disappointed that what was &quot;the best whey protein on the market&quot; is no longer available from Biochem. Wish I could find the &quot;pre-Country Life&quot; Biochem whey protein! I would stock-up on it! Unpleasant aftertaste. Doesnt taste as great as the original Biochem formula. Doesnt mix as well. 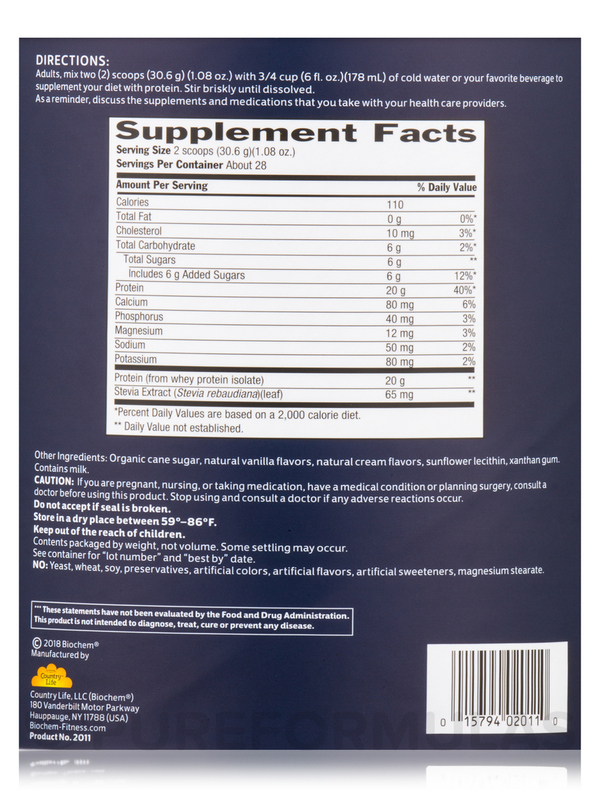 I have been using this product for about two years to help with my daily calorie needs and nutritional requirements. I lost a lot weight during and after heart surgery.The Nutritionist recommended a Whey Protein drink every day. I tried several brands but this seemed to be a better taste. I buy two cans a ta time to save on shipping. Its hard mixing with a spoon so I mix it with a light cherry mix bottled drink. Then shake it up vigorously and let it sit in the fridge overnight. Then Im good to go the next day then repeat the process for the next day. What's the difference between this and the ultimate protien system? Hello Andrea, thank you for contacting PureFormulas. Both products contain the same amount of protein. However, the main difference will be in the vitamins, minerals and the quantities of each.